Quinoa has been the talk of the town for a while now – and with good reason, it’s complete protein, tasty, versatile, and easy to cook. On nights where you want a super simple, yet also very healthy meal option the quinoa recipe below is just the ticket. 1. Place the quinoa and broth into a medium sauce pan and bring to a boil. 2. After the quinoa has reached a boil, cover the sauce pan and turn the stove down so that the quinoa simmers for about 15 minutes (until the broth is gone). 3. While the quinoa is cooking prepare the black beans (either warm up a can of beans or warm up your own pre-cooked beans). 4. Also while the quinoa is cooking, chop up the red bell pepper into bite-sized pieces. Those pictured above are the size of a small peanut. You can add them raw or sauteed them up in a little bit of EVOO to soften them. 5. 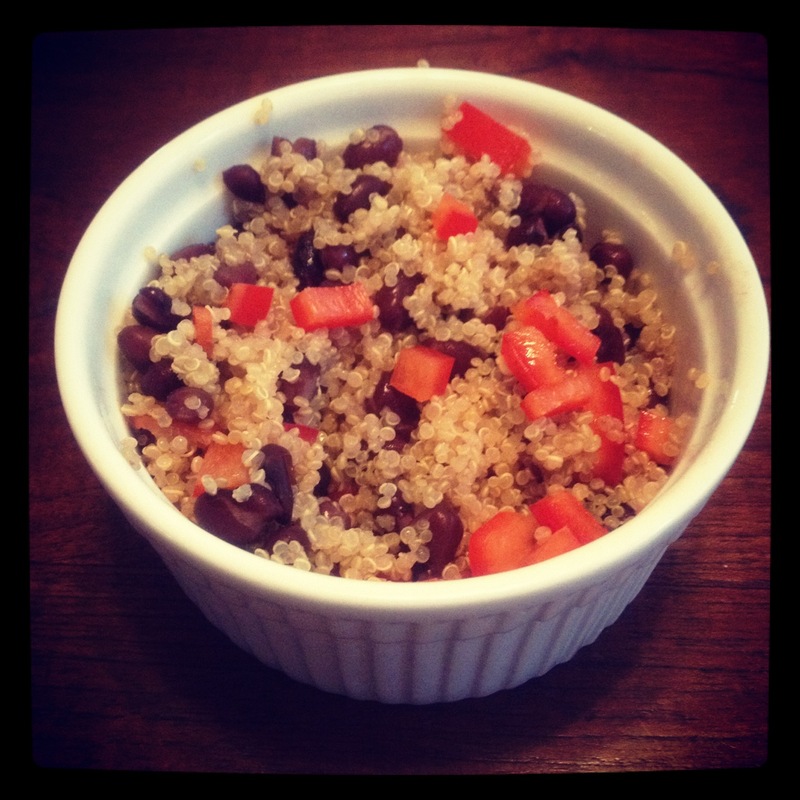 Once the quinoa is cooked combine it with the black beans and red bell pepper and mix ’em all up. Next post: Can You Do Yoga In the ‘Can’?